Hello Julia, thank you so much for agreeing to this interview! Would you start by telling us a little bit about yourself? Just a little? I was born in September 1939 at Greenwich, my father was already in France, I didn’t see him until I was six. I have two younger sisters and a brother. I was a grammar school girl. Barrie and I married in 1960 and had a boy and a girl. We lived in Australia for two years. We now have, seven grandchildren and 17 great-grandchildren. Our daughter and one of my sisters were also midwives. I know you had a very successful midwifery career, when did you commence your training, and what were the highlights? I applied to train in 1969, I was offered a place on the direct entry programme in Nottingham. My training and the time I spent on the district, with my teaching, district midwife Joyce, has informed everything I have done since. Once qualified, I worked as a district midwife, giving the one to one care at home, that few women or midwives get to experience today. District midwives worked alone, other than support from the woman’s family or friends. When home births dwindled, I trained as a midwife teacher. I gave my intention to practice independently to deliver my grandson at home. I read for a Masters in social policy and administration, at Nottingham University, England, and began the research which would eventually become ‘Delivered at Home’. I was appointed Head of Midwifery Studies at University of East Anglia. The Department of Health bought my time from the University to write an account of my research, this was given as evidence to the House of Commons Select Committee, which produced Changing Childbirth. 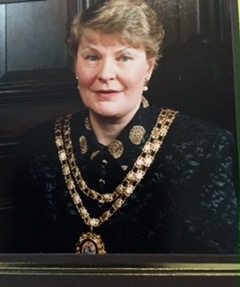 Later I was appointed as President of The Royal College of Midwives (see photo below!) and then General Secretary. 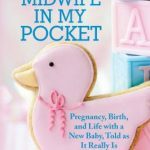 What do you think has changed between the midwifery you knew, and now? 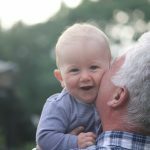 Everything has changed, particularly the belief that childbirth is a normal process, which can mostly be safely managed by a mother and a midwife working together. The propaganda that birth is only normal in retrospect, damages the confidence of midwives and mothers. 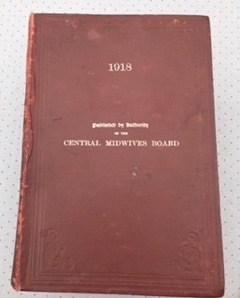 The loss of the Central Midwives Board (CMB), which, while it controlled midwives and their practice and protected childbearing women, it also understood, supported and encouraged the profession. I love your book, ‘Delivered at Home’ – what inspired you to write it? 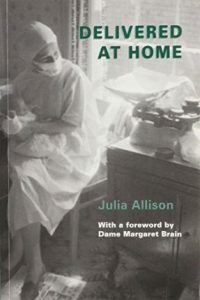 I was inspired by all the midwives and mothers who wanted, but would never experience a home birth. The last of the district midwives were the last midwives to have the courage of their convictions based on their own experiences. 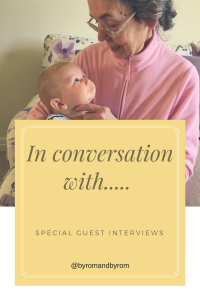 I was inspired by the fact that I knew home birth was safe, yet thousands of women every year were hospitalised for birth, against their wishes, using precious hospital resources unnecessarily. 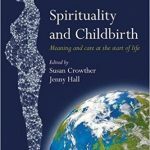 Sheena says: this book is a ‘must read’ for anyone interested in the social history of childbirth and midwifery. 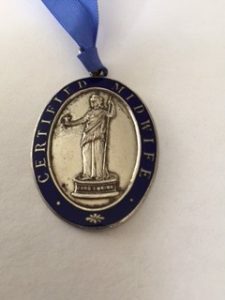 I see from Facebook that you collect midwifery memorabilia – which I find so interesting. Can you tell us about this hobby, and any special items of interest? It began when I did the research for ‘Delivered at Home’. I collected some 200+ midwives’ registers from my colleagues to analyse. I still have some of them and others I have acquired along the way. I have a lot of CMB memorabilia and items given to me by Joyce, my district teaching midwife. 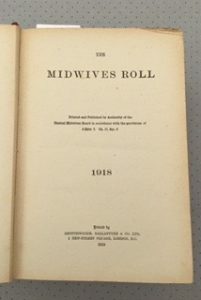 I collect antiquarian books, especially related to midwifery. 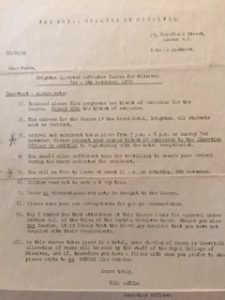 My favourite item is Joyce’s shorthand transcript, of an entire RCM refresher course, at Brighton c.1957, including midwives Q and As, at the end of each session. I am slowly transcribing it, Mr Fenny of the CMB gave one of the presentations. Julia sent photographs of the artifacts above (left to right) 1918, CMB Roll of Practising Midwives, showing cover and front page, and the badge of E. Harper, roll number 44410, who qualified on 26.6.1916. What are your plans for the future Julia? I am determined to reveal the historic outcomes of midwifery care, before the arrival of accoucheurs. Most existing histories would have us believe that maternal and infant mortality was very high before medical men intervened. I have tested this theory, by searching Tudor records, finding midwives and analysing their birth outcomes. I transcribed six 16th century parish registers, from Latin or English. I was awarded a PhD and an Hon. DSc. in 2013. I am now, transcribing the thesis into book form. What gold nuggets of advice would you offer student midwives today? 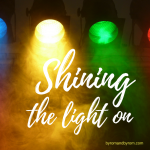 You will be standing on the shoulders of some brave and wonderful midwives, Agnodice, Jane Sharp, Zepherina Veitch, Rosalind Paget, Catharina Schrader, Elizabeth Peverel to name a few. Believe in yourself, and believe in the women you care for. The measure of a true profession is its academic ability to explain its unique value to society. Midwifery has found a place in higher education and we must use the opportunities it offers to the full. Wow, Julia. Thank you so much for sharing a snippet of your life, your work and studies, and your fascinating hobby! You have left us hungry to hear more…we hope you’ll keep adding to this blog post, as you reveal other treasures. Readers! Please leave your comments below, and tell Julia what you think!